« Big Koch Brothers Are Watching Us! Federal Election Commission filings released this week showed that conservatives groups are amassing an ocean of cash for the 2012 presidential campaign. 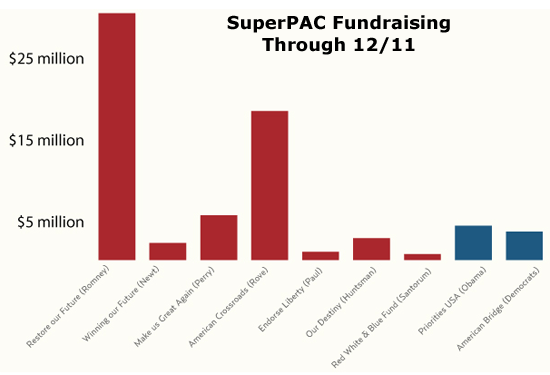 Thanks to the likes of the Koch brothers, the Walton clan and other of the usual suspects on the right, in 2011 conservative SuperPAC’s outraised their liberal counterparts by more than seven to one. But if they win, rich Republican donors could more than get back the millions they invested. As it turns, just one law they are trying to buy – the elimination of the estate tax – could put billions of dollars back into their families’ bank accounts. Of course, that gaping hole would have to be filled by all other American taxpayers. At a private three-day retreat in California last weekend, conservative billionaires Charles and David Koch and about 250 to 300 other individuals pledged approximately $100 million to defeat President Obama in the 2012 elections. A source who was in the room when the pledges were made told The Huffington Post that, specifically, Charles Koch pledged $40 million and David pledged $20 million. According to a quick back-of-the-envelope calculation, the Koch brothers’ heirs’ would save a combined $17.4 billion in estate taxes thanks to Romney’s plan. Each of the Koch brothers — Charles and David — is worth about $25 billion. They are each married, so they would receive an exemption on the first $10 million that they pass down, and then theirs heirs would pay a 35 percent tax, or $8.7 billion, on the rest of their vast fortunes. Now, this is an exceedingly rough calculation, as it’s almost certain that the Koch’s have engaged in extensive estate planning and would pay nowhere near that amount. But 35 percent is the rate on the books, and Romney’s plan to eliminate the estate tax entirely would undeniably save the Kochs a boatload of money. Here’s why. Despite Republican mythology about family farms and businesses being lost to the so-called “death tax,” by 2009 only 0.24 percent of estates even paid the levy. And that was before the December 2010 compromise President Obama inked with Congressional Republicans extending the Bush tax cuts further slashed the estate tax. The reduced 35 percent tax is now applied only to couples with estates greater than $10 million, a change which will cost Uncle Sam roughly $15 billion a year. Now, the Tax Policy Center calculated, only 0.1 percent of estates are impacted. Only 50 family farms and small businesses will be affected, and they contribute “less than one tenth of 1 percent point of the total revenue the tax will collect.” Who pays the estate tax? Estate tax liability will total an estimated $10.6 billion in 2011. The top ten percent of income earners will pay 98 percent of this total. The richest 1 in 1,000 will pay $5.4 billion or 51 percent of the total. Among that richest 1 in 1,000 are the Koch brothers and the family behind Walmart, the Walton clan.